We have a Samsung RS261MDBP refrigerator, which is a side-by-side, frost-free model, with the freezer on the left, and refrigerator on the right. 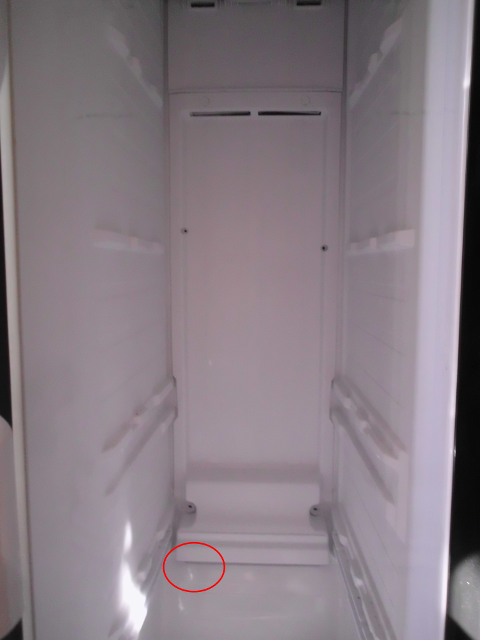 The red circle near the bottom right of the freezer was where the leak was. 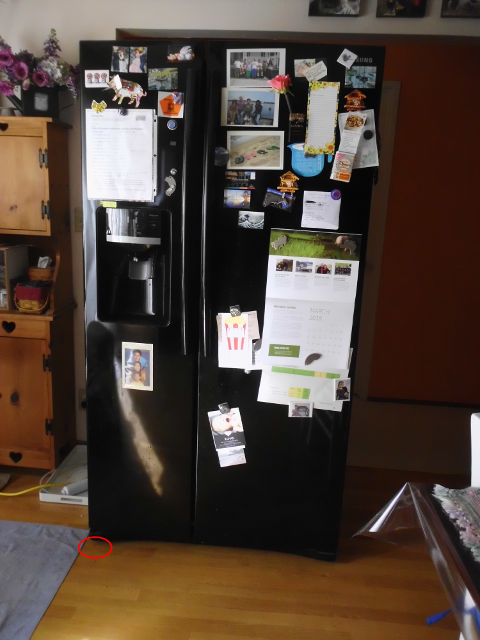 One day, I noticed a puddle of water on the floor under the freezer. Since it was on the side with the water/ice dispenser, my first thought was that it might be the dispenser leaking. 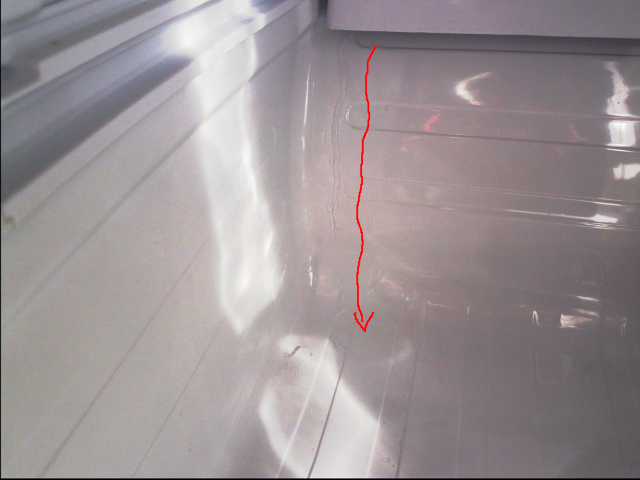 But then I opened the freezer door and noticed a frozen stream of water coming from inside the freezer. The freezer was still plenty cold, so I doubted it could be something melting. I took out the bottom drawer of the freezer, and then noticed a solid sheet of ice at the bottom of the freezer. I removed all the ice, and the problem went away for about a day, but then two days later, it was back, and so was the ice sheet. I never actually witnessed the water actively dripping. Okay, nothing to do but roll up my sleeves, move all the food out of the freezer into an ice chest, and figure out what fed that ice sheet. The shelves and drawers have been removed from the freezer. It’s hard to see, but there’s a frozen stream of ice to the left of the red line. At one time, this was probably flowing liquid water that filled the floor of the freezer, and leaked out the door onto the floor of the room. The stream of ice appears to originate from behind that white panel, in the area indicated by the red circle. A bit of an aside as to how (I think) a frost-free freezer works. About once a day, a heater coil turns on for 5 minutes to melt off any frost that may have accumulated on the freezer coils. 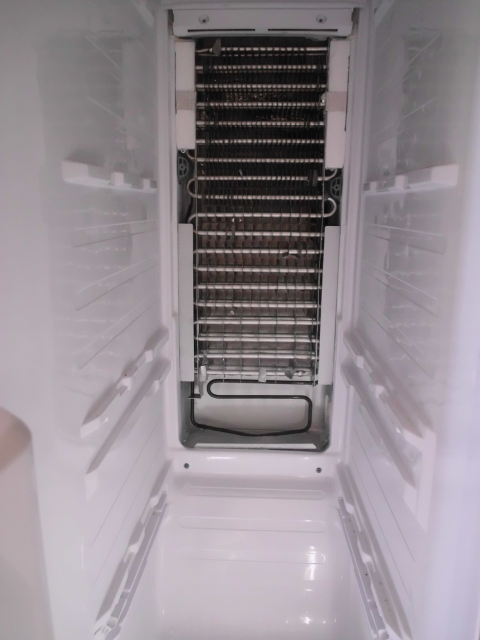 That water drips down into a pan under the refrigerator, where a fan evaporates it into the air. If that defrosting was happening at 3 am, it would explain why I never witnessed any actual dripping. White plastic caps conceal screws in 4 places. The screws were removed, and the panel came right off. 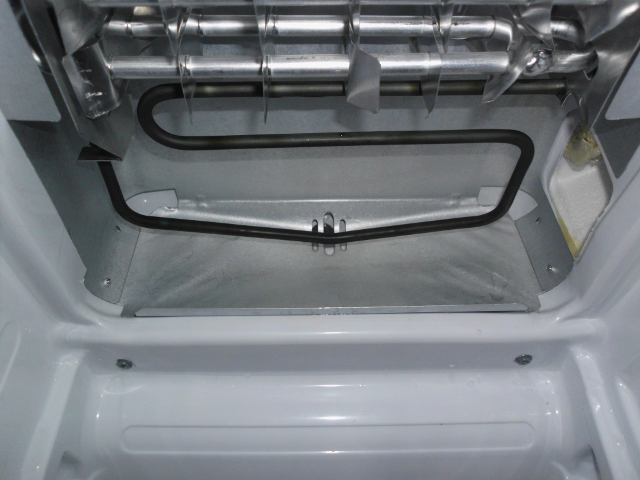 With the cover removed, the freezer coils can be seen. The black heating element at the bottom is the defroster. 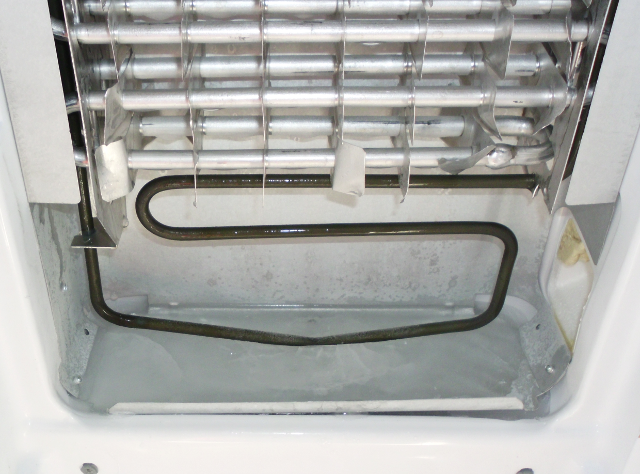 The black heating coil is actually embedded in ice. My feeling was that the coil must have been working to some extent, since there was water dripping onto the floor. But perhaps the coil was not melting ALL the ice. A hair dryer and some warm water melted the ice, revealing a previously unseen drain. Most likely, the drain had been clogged with ice, more than the defroster could melt in 5 minutes. I melted and cleaned out every bit of ice that I could see, and made sure that when I poured a half cup of water into the drain, it freely flowed into the evaporation pan under the fridge. Success. I put everything back together, and it’s been working fine for a month, now. But how did this situation come about in the first place? 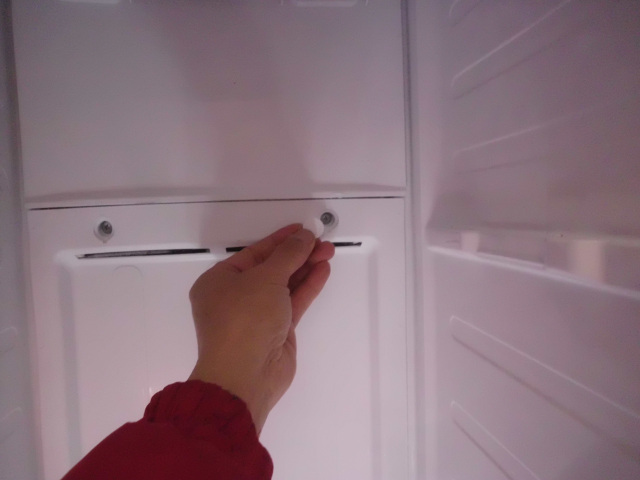 My theory is that the freezer door had been open for a LONG time in humid weather, as we were reorganizing the freezer. Possibly, that gave an excessive amount of frost a chance to accumulate, and block the defroster drain.